Asus has taken the unusual step to send us a full Q&A document on its involvement with the Google Nexus 7 tablet, lifting the lid on the design and collaboration process with Google. The document provides fascinating insight into the design process behind the Nexus 7 – incredibly the idea for the device was only born in January. "At CES 2012, the executives of Google and Asus met up to discuss future cooperative opportunities and the Nexus 7 was born," says Asus in the document. "From the concept in January, the target was to have the device ready in 4 months – a huge challenge, as a normal product design cycle is usually between 6 and 12 months." Google sent engineers to Taiwan to work alongside the Asus team while Asus employees worked at various locations, including Google's Mountain View headquarters, to develop the device with Google in a 24-hour development cycle. Asus says that Google was very strict in terms of design and quality, "a culture that is very similar to that of Asus, so Asus enjoyed working with them on this challenging project. "Software and hardware need to go hand in hand and Google wanted to have a perfect device working perfectly with their software." In the document Asus also talks a little about the details in its so-called 'Design Thinking' philosophy which extends to small elements such as the placement of the headphone socket. "Users may use the device while listening to music with headphones. If the headphone socket is located on the top of the tablet, the headphone cable may fall across the display – not the best usage scenario. Therefore we moved it to the bottom of the tablet, where the microUSB port is, to prevent this kind of issue." As for sound, the company says a lot of work was put in there, too, with speaker placement and the dual-microphones: "Some people will hold the device in their right hand, while others will hold it in their left. Sometimes you might be using the device in portrait mode and other times in landscape mode. "If there is only one microphone, the user's hand may block it and the performance could be reduced when using applications like Skype or other video/audio apps. On this device, since it is very much for media consumption, we decided to put two speakers at the bottom." Talking about the rear cover, Asus says the tactile back is down to the fact it thinks most use will be on the go. "We needed to make the device easy to grab, so end users can feel confident holding it. We wanted to make the textured back cover feel like a pair of premium driving gloves that will not slip out of your hands." Asus also says its engineers spent a month measuring the power used by every single component and doing point-to-point connections on the PCB to find power inefficiencies. "On the software side, it's about finding the user usage scenario and optimization. The LCD, CPU and Wi-Fi consume the most power in the device, but we don't need to run [the] full quad-core CPU while browsing the internet. We don't need the device to check the Wi-Fi signal every second while watching a movie clip downloaded to the device. "The Asus software team spent a lot of time and effort simulating different usage scenarios, and finding ways for components to coordinate with each other to enhance battery life. 9.5 hours is just a simple number, but the effort and expertise required to achieve that from such a powerful device was huge." Why no microSD and front camera? There was also some light shed on why the device doesn't have a much-asked for microSD slot or rear camera. "Asus believes the main usage scenario for the device will be based around the cloud, using the wide range of popular cloud-based services to access their digital media." On the lack of rear-facing camera, it's a matter of price. "To make this device accessible to the widest possible market, price is very important. Asus believes that for this device a good rear camera is important. Adding a high quality rear facing camera will increase the price point and many users would not have a use for it. 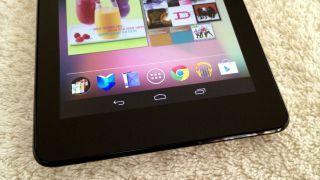 "Adding a lower quality rear facing camera would compromise on the overall user experience so the decision was made not to include [one] therefore keeping the price down and user experience extremely high"
And, on the lack of rotation on the home screen, Asus says it's all down to Google: "Google believes that on Nexus 7 by Asus, the portrait mode is the best usage scenario for end users." Asus and Google say they both have "a mutual goal to make the most successful Android tablet ever and we are very confident in our ability to achieve that." On future opportunities with Google, Asus says it is "very much looking forward to continuing the development this relationship and possible future opportunities to work together."